You may remember this report about Goose Green School’s parent-led clean air incentives . We were very happy to be part of this scheme, and now the plan has proven itself a success with the release of a report indicating that their playground air pollution has been cut by almost half. We often can’t see or smell it but it is now widely known that air pollution is a killer. Children’s growing lungs are particularly vulnerable to its effects and research suggests exposure to particulate matter whilst growing up can reduce lung capacity by up to 17%. 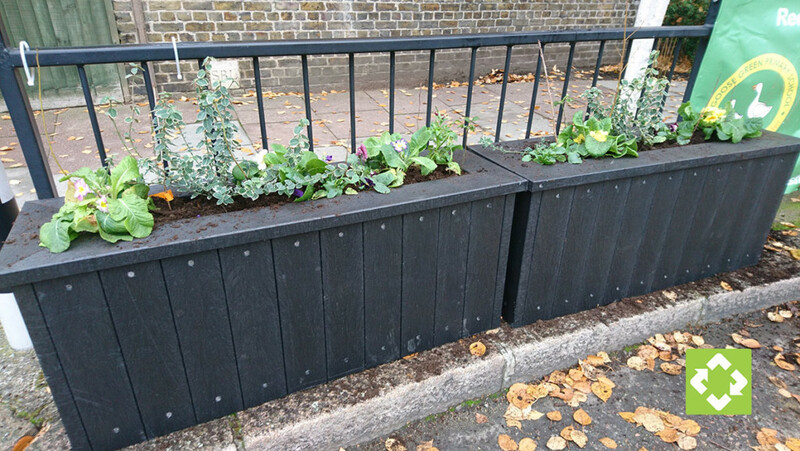 For the second year running, an initiative led by parents and carers at Goose Green Primary and Nursery School in East Dulwich, South East London, has received funding from the Mayor of London’s Greener City Fund to improve air quality around the school. Like many schools in London, Goose Green School stands on a busy main road with buses, cars and commercial vehicles passing close to where children learn and play throughout the school day. In 2018, Goose Green Primary was the first state school in London to put air purifiers in each of its classrooms. It also successfully installed one of Southwark’s first school ‘Green Screens’. Indicative results of nitrogen dioxide (NO2) levels inside the Green Screen in early 2019 show a 48% reduction compared to the level measured in early 2018 before the installation of the Green Screen. Current NO2 levels inside the Green Screen are also 52% lower than the current levels outside, next to the road. These reductions mean that the whole of Goose Green School’s playground falls within the EU legal limits for NO2. Planters with eight-inch plants growing. The plants are growing nicely and will be added to with the new planting project currently being planned. The school continues to show how communities can take action to provide a healthier environment and contribute to better air quality for all with its Clean Air Garden Project. In 2017 when Goose Green Primary commenced its Green Screen Project, Jennifer Gabrys of Citizen Sense came to tell the pupils about phytoremediation – the amazing ability of plants to clean dangerous toxins out of the air. Inspired by this and keen to further improve its play space, the school put together a plan for a Clean Air Garden. So impressed was the Mayor of London by the scheme – and the ongoing efforts of the school to tackle the problem of air quality – that he has contributed over £6,000 from his Greener City Fund. The Project will include new planters and a trellis made of British recycled plastic, vast amounts of new plants chosen from the Citizen Sense Clean Air Toolkit, two new trees, eight metres of mature pollution barrier planting for the school’s entrance and further diverse planting along the school’s 80m boundary to create a wildlife haven and encourage biodiversity. The school’s new Gardening Club will also benefit, with a lump sum to spend on new plants (including edibles), seeds and equipment. If all this has inspired you to see what you could make with our recycled plastic planters, you can find more information here.